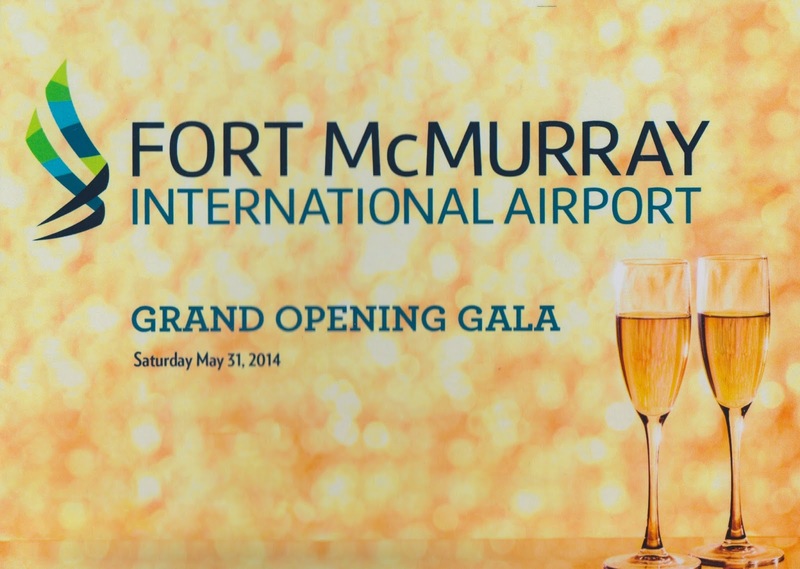 Truth be told, I didn't want to go out to the airport grand opening gala last night. I had had a beautiful, quiet day of working around the house and would have been quite happy to have stayed home. But, I dutifully got my shoes all shined up and my tux ready in case Heather was still eager to go when she got home from a day of teaching. She was; so we did. I am so glad. With the airport terminal in mind that we have used since 1986, the overall effect of driving up to the beautiful new terminal and walking into its expansive space would be like checking out of the old Riviera Motel on Franklin and into the Beverley Hill Hilton. The difference is truly that profound. 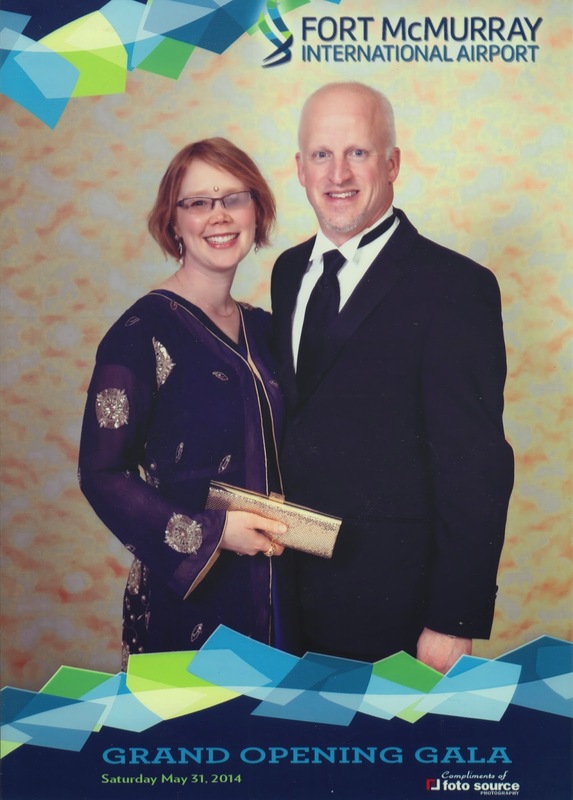 What has become a revered "gala" activity in Fort McMurray, our first stop after checking in was to get our portrait snapped. Heather and I have several of these shots from over the years. I treasure them all. She looked especially amazing last night and inspired many comments from friends and strangers alike as we meandered through the arrivals, departures and observation deck levels. Colonel Chris Hadfield brilliantly presided over a formal program before they swung open the metaphorical doors and allowed us to explore the entire facility. We went right up to the departures level, starting on the south end and slowly worked our way to the north end, a football field - and then some - away. It was slow going, as we met old friends and enjoyed delightful conversations with Mark (Suncor) and Ruth Little, Dave Mowat (ATB) and his wife, Phil Enarson (Westbrier Communications), Paul (CEDA) and Barbara Taylor, Tony (Nexen) and Monica Mankowski (FMCSD) and so many others. The space is enormous, with comfortable seating, and most importantly, USB and power outlets at every single chair. The east facing windows are incredibly high and provide an abundance of natural light and a panoramic view. You'll be able to stand close to one of these tall windows and watch the sunrise, the northern lights when they are out, or an explosive lightening show. They are enormous and seemingly reach to the sky. Wood is present throughout the facility. Acoustically treated and beautifully designed walls and impressive ceiling beams warm up the vacuous spaces and provide an earthiness, an overall effect that aligns well with our northern locale. Apart from having room to move, copious amounts of natural light at the both the arrivals and departures levels, the biggest practical difference between our current terminal and the one that will open June 9th is the number of amenities. There are shops, restaurants, coffee shops and convenience outlets on both sides of security. Folks flying in and out will have access to Earls, Famoso Neapolitan Pizzeria, Mary Brown's, Tim Horton, Best Buy Express, Burger King, Subway, Jugo Juice, Nicholby's Convenience, Elements, and Chocolates and Candlelight. Heather and I ran into Melanie Ferrence, the owner of the successful local chocolate and candle emporium, standing in the security screening area between the check-in and the departures area. "Are you exciting or petrified?" I asked Melanie. "(laughter) Oh, a little of both I guess," she said. "It will be nice to get the doors open and get moving." How right she is. For the last couple of years, our region has weathered an exponential growth in the passenger volume while still relying on a facility that was built to handle only 250,000 people per year. As the days wind down on the use of the North Terminal, well over a million passengers a year are passing through its inadequate arrivals and departures areas. June 9th can't come soon enough. We were up on the observation level, admiring the stunning bitumen painting that covers almost an entire wall in the board room, when artist Lucas Seaward walked in with Colonel Hadfield. 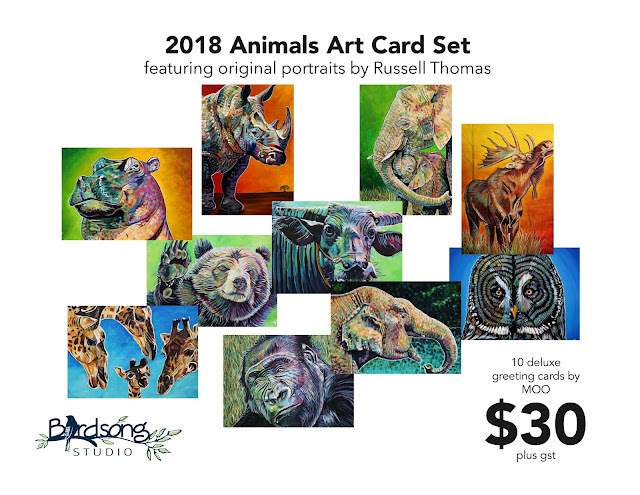 They spent several minutes in conversation, talking about the contents of the painting and the unique bitument painting process. "Sky Explorer" pays tribute to the bush pilots who played such an important role in opening up the north, and are synonymous with Fort McMurray. The perspective, achieved through a fisheye lens view of a plane taking off on the Snye, is intoxicating, immersive, and magnetic. As is Seaward's signature style, numerous silhouettes and figures reside in the background, enhancing the story and providing additional symbology and meaning. "Did you use me as the model for the guy fishing?" I asked. "I absolutely did," said Lucas, smiling broadly. There has been a little pushback on social media regarding the fact that this stunning piece is tucked away in a board room. However, it appears that one wall can completely open up when the room is not in use, which suggests that the public may have access to it from time to time. Indeed, it would be a pity if they did not. 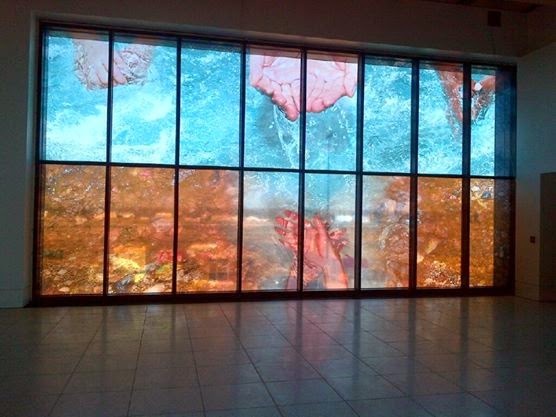 We also appreciated Liz Ingram's "Water Ways, Sensing Connection" incorporated into the glass wall on the north end of the post-security passenger lounge. It infuses a splash of colour and a sense of wonder and whimsy, immediately catching your eye, even from the opposite end of the departures lounge, over 100 metres away. 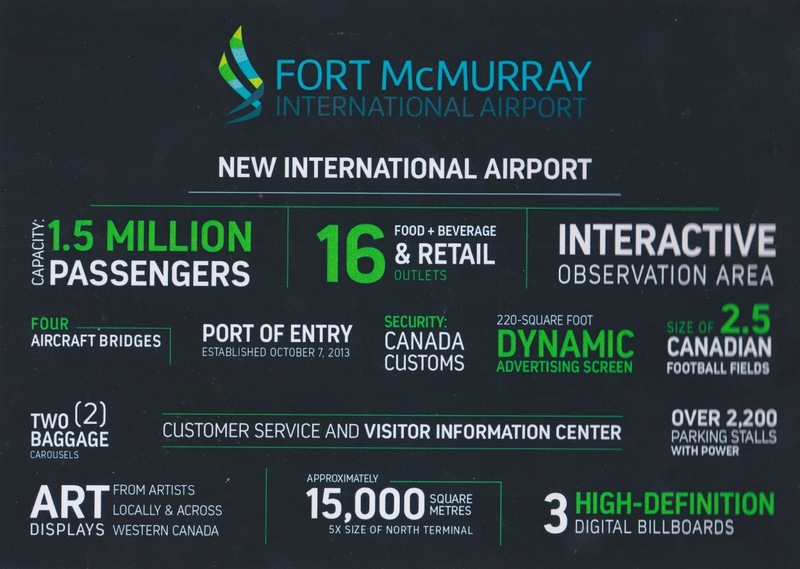 I don't feel that we saw everything, even after spending three delightful hours in the new YMM terminal building. I can't wait to go back, explore, and use the facility from the perspective of a customer. Then, the true difference will settle into my bones, and provide fodder for another blog post. Two dimensional photographs, illustrations, and statistical talking points only begin to give you a sense of how important this development is going to be for our region. When you're standing there, soaking in the view, and imagining the impact of a person arriving in Fort McMurray for the first time, then it hits. 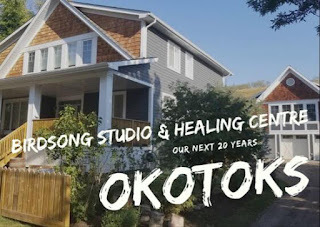 In one fell swoop we will go from being perceived as "the world's largest work camp" to being "a northern oasis, a magical destination nestled in the beautiful boreal forest and under an amazing sky". The narrative shift will be immediate, compelling and a game changer.